Art direction: I have two words for you: Magic Fireball! Have some leather clad guy holding an old school hunting rife casting it. Just make sure that the fireball is purple! Magic is purple…. right? since when could Jack Shepard from “Lost” create magic balls of purple fire? Haven’t had a cover in a while with such purple magic fireball use! I also like that the girl manages to look so completely helpless even when holding a rifle. I think he suffers penalties for dual weilding. but he might have the ambidextrous merit! 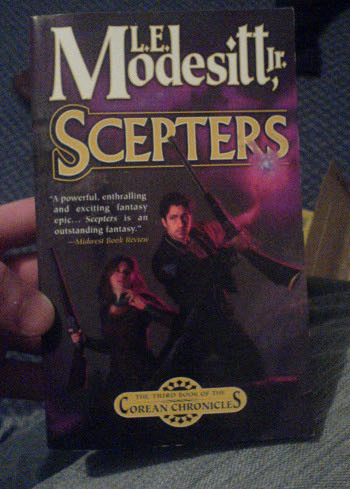 Scepters… that look like shotguns, gosh durn it! This is the beloved “Bollywood Dance Scene” which appears in the Canadian edition. I don’t think the damsel looks useless — she’s holding the rifle firmly with the barrel pointed away from herself and the dude, but ready to use.